Teri McCall was one of many California residents to cheer all of the rulings against Monsanto. Her husband, Jack, sprayed Roundup on the family's California farm for nearly 30 years. In September 2015, Jack went to see a doctor to treat swollen lymph nodes in his neck. That day in the hospital, he learned that the swelling was caused by anaplastic large cell lymphoma (ALCL), a rare and aggressive version of non-Hodgkin lymphoma. Three months later, Jack suffered a severe stroke due to complications with his cancer treatment. He died on Dec. 26, 2015. In the wake of her husband's death, Teri McCall filed a wrongful death lawsuit against Monsanto, alleging the company knew about the link between Roundup and cancer, but failed to warn the public about the risk. "My husband Jack was very conscious of the dangers of chemicals, and his misfortune was taking Monsanto's word that Roundup was safe," said McCall at a press conference held on January 27 in Fresno following Judge Kapetan's tentative ruling. "I don't want to see any more unsuspecting people die from cancer because they didn't know of the danger to their health from exposure to Roundup. Glyphosate in Roundup needs to be on the list of Prop 65 chemicals that are dangerous to our health so that people can make informed decisions for themselves about the risks they are willing to take. I don't believe my husband would have been willing to take that risk," McCall said. McCall is represented in her Roundup cancer lawsuit by Baum, Hedlund, Aristei & Goldman and environmental lawyer Robert F. Kennedy, Jr. In 1986, California voters approved Proposition 65 to address concerns about exposure to toxic chemicals. Prop 65 requires California to publish a list of chemicals known to cause cancer, birth defects or other reproductive harm. The California Office of Environmental Health Hazard Assessment made its decision in July 2015. The agency maintains that it followed proper procedures in listing the herbicide and "stands by its decision." OEHHA is the administrator for the Proposition 65 program and determines in many cases whether chemicals or other substances meet the scientific and legal requirements to be placed on the Proposition 65 list. The agency uses a "Labor Code" listing mechanism, which directs the OEHHA to add chemicals or substances to the Prop 65 list of chemicals known to the state to cause cancer if they meet certain classifications by the IARC. 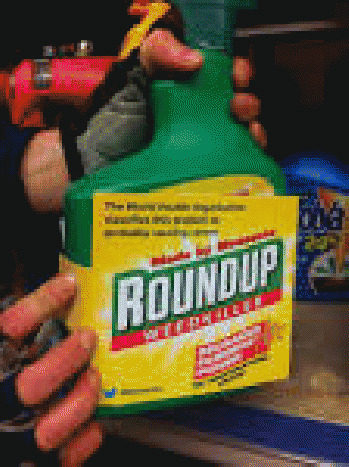 Glyphosate is a key ingredient in Monsanto's top-selling weedkiller Roundup, and the lawsuit said 250 crops are grown using glyphosate.